By the mid-1880s Stanford was a composer of three operas (which had met with distinctly mixed success), two symphonies, songs, some highly original church music, as well as chamber works. Professionally his confidence and reputation, both nationally and internationally, had grown appreciably, and his standing as a conductor of the Cambridge University Musical Society and the Bach Choir (as well as guest appearances with the Philharmonic Society and other orchestras around the country) was also in the ascendant. It was at this crucial juncture, buoyed up by the high repute he enjoyed among his colleagues, that he began his grandest chamber work, the Piano Quintet in D minor Op 25. ‘I look forward to your Quintet with great interest’, wrote Joseph Joachim to Stanford on 7 February 1886; within four days Stanford had written back to his friend to confirm that he had already finished the first three movements and that the finale was already partially written. Joachim, a regular visitor to Cambridge and probably the most important musical influence in Stanford’s career, had always given much attention to the young Irish composer’s music. He had given advice to Stanford during the composition of an early student violin concerto in 1875 and, in 1876, had acted as an adjudicator for a symphony competition at the Alexandra Palace in which Stanford’s entry (his First Symphony) had won second prize. Their friendship had blossomed in the 1870s when Stanford was studying in Germany, and after Stanford’s return to Cambridge in January 1877 a professional relationship flourished, especially after the eyes of England had rested on Cambridge for the first English performance of Brahms’s First Symphony and Joachim’s honorary doctorate at the university. For his part, Stanford had always been an admirer of Joachim’s playing. He had heard him as a youngster in Dublin in the 1860s and later in Berlin when the Joachim Quartet had premiered Brahms’s String Quartet in B flat major, Op 67. It was therefore perhaps inevitable that Joachim would be the focus and dedicatee of several of Stanford’s works, but the fact that the first dedication was the Piano Quintet clearly revealed that the composer wished the work to act both as a major tribute and a lasting debt of gratitude to his mentor. Stanford’s Piano Quintet was completed at the beginning of March 1886 and Joachim, who came to Cambridge that same month to play Beethoven’s Violin Concerto, was able to hear an informal play-through at Stanford’s home. It was first performed on 10 June 1886 under the aegis of the Cambridge University Musical Society at the Cambridge Guildhall when Stanford again appeared as the pianist. It was published not by a German firm but by Novello, who, in doing so, clearly believed that the work was an important one to have in their catalogue. Their business instincts served them well: the Quintet proved to be widely played in England and abroad, attracting pianists such as Hallé, Dannreuther, Heckmann and Coenen. Clearly influenced by the ambitious scale of the quintets by Schumann and Brahms, Stanford conceived his work on a grand scale in which an overarching narrative – the first two movements in minor keys, the last two in major – transported his audience from melancholy introspection to extrovert joy and optimism. D minor was for Stanford a key of troubled rumination (his Second Symphony, subtitled ‘Elegiac’ and probably written in memory of his father, inhabits the same tonal world) and this is evident in the dark, almost sinister opening of the first movement, a massive, intellectual essay of Doric proportions which, like the first movement of Brahms’s F minor Quintet, Op 34, has a complex matrix of organically linked thematic motifs and tonal relationships. Within the highly polyphonic and at times dense texture, Stanford, with his insistence on the dominant and submediant steps of the scale (A–B flat – note especially the retrograde at the beginning of the development), almost seems to paraphrase Brahms’s similar preoccupation with the same structural motif in his own Piano Quintet; and the second subject suggests a tribute to Schumann both in the manner of its introduction by the solo cello and the accompanying harmony. The movement ends with a glimmer of optimism, but for the jig-like Scherzo, in G minor, we are plunged back into a disturbing, demonic frame of mind, unsettled by the shifting metres, irregular phrase patterns and the fluid tonality. Temporary relief is provided by the simpler ‘folk-song’ style of the Trio which hovers between the dominants of G and B, but in the background disquieting undercurrents of the demonic jig lurk in the cello and viola. With the slow movement, couched in B flat major (a significant motivic link with the first movement), the shadows begin to lift as the euphony of Stanford’s great gift for self-developing lyrical melody is given room to expand. Indeed, such is the richness of Stanford’s contrapuntal conception, one almost senses that, like Brahms in his quintet, the composer moves beyond the medium of string quartet and piano to one of orchestral grandeur, an impression reinforced by the massive architecture of the second subject (similar in its manner to the magnificent slow movement of Parry’s Piano Quartet, published in 1884). Later corresponding movements of Stanford’s third, fifth and sixth symphonies, which display an overwhelming mastery of melodic inspiration, suggest in fact that this movement may well have been an important template. Building on the aspiration of the slow movement, the finale provides a grand, radiant conclusion in which D major, a key with such strong associations of joy and elation, has special significance. 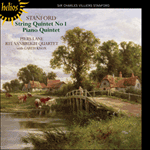 Here Stanford’s musical ideas have an invigorating muscularity and rhythmical drive, features which are emphasized in the second group and even more so in the enthralling developmental phase. This vitalizing energy, which serves to expel the gloom of the first half of the work, gives the movement a compelling sense of momentum, and to the work as a whole an aura of self-assurance that would infuse Stanford’s next large-scale instrumental work, the ‘Irish’ Symphony of 1887. Au milieu des années 1880, Stanford avait composé trois opéras (au succés clairement mitigé), deux symphonies, des mélodies, de la musique liturgique fort originale, ainsi que des œuvres de chambre. Sa confiance et sa réputation professionnelles avaient connu une progression nationale et internationale appréciable, et sa renommée de chef de la Cambridge University Musical Society et du Bach Choir (il fut également chef invité de la Philharmonic Society et d’autres orchestres du pays) était, elle aussi, en pleine ascension. Ce fut à ce moment critique que, gonflé par la grande réputation dont il jouissait parmi ses pairs, il entreprit sa plus grandiose œuvre de chambre, le Quintette avec piano en ré mineur, op. 25. «J’attends votre Quintette avec grand intérêt», lui écrivit Joseph Joachim le 7 février 1886; quatre jours plus tard, Stanford récrivit à son ami pour lui confirmer que les trois premiers mouvements étaient terminés et que le finale était déjà en partie écrit. Joachim, qui se rendait régulièrement à Cambridge et qui exerça probablement la plus forte influence musicale sur la carrière de Stanford, avait toujours prêté une extrême attention à la musique de ce jeune compositeur irlandais, auquel il avait prodigué des conseils en 1875, durant la composition d’un concerto pour violon estudiantin. En 1876, il avait aussi été juge dans un concours de symphonies à l’Alexandra Palace, où la Symphonie no 1 de Stanford avait reçu le deuxième prix. Leur amitié s’éait épanouie dans les années 1870, alors que Stanford étudiait en Allemagne; puis une relation professionnelle fleurit après le retour de ce dernier à Cambridge (janvier 1877), après, surtout, que les yeux de l’Angleterre se furent posés sur cette ville pour la première anglaise de la Symphonie no 1 de Brahms et pour le doctorat honoris causa de Joachim. Stanford, lui, avait toujours admiré le jeu de Joachim, qu’il avait entendu, jeune homme, dans les années 1860, à Dublin, et, plus tard, à Berlin, où le Quatuor Joachim avait créé le Quatuor à cordes en si bémol majeur, op. 67 de Brahms. Peut-être était-il inévitable, dès lors, que Joachim fût le cœur et le dédicataire de plusieurs œuvres de Stanford, mais le fait que la première de ces dédicaces ait concerné le Quintette avec piano révèle à l’évidence combien le compositeur voulut cette pièce comme un hommage majeur, une dette de gratitude durable envers son mentor. Le Quintette avec piano fut achevé au début de mars 1886 et Joachim put en entendre une exécution informelle chez Stanford, à Cambridge, où il vint jouer le Concerto pour violon de Beethoven, justement en mars 1886. Créé le 10 juin 1886 à la Cambridge Guildhall, sous l’égide de la Cambridge University Musical Society (avec, de nouveau, Stanford au piano), le Quintette fut publié non par une maison allemande mais par Novello qui, ce faisant, estimait à l’évidence qu’il s’agissait là d’une œuvre importante à avoir à son catalogue. Un instinct commercial qui fut payé de retour: le Quintette fut largement joué en Angleterre, mais aussi à l’étranger, attirant des pianistes comme Hallé, Dannreuther, Heckmann et Coenen. Manifestement influencé par l’ambition des quintettes de Schumann et de Brahms, Stanford conçut son œuvre à grande échelle, une narration de toute importance – les deux premiers mouvements dans des tonalités mineures, les deux derniers en majeur – faisant passer l’auditoire de l’introspection mélancolique à la joie extravertie et à l’optimisme. Ré mineur était, pour Stanford, une tonalité de rumination soucieuse (sa Symphonie no 2, sous-titrée «Elegiac» et probablement écrite en souvenir de son père, baigne dans cet univers tonal), ce qu’atteste bien l’ouverture sombre, quasi sinistre, du premier mouvement, un massif essai intellectuel sur les proportions doriques qui, comme le premier mouvement du Quintette en fa mineur, op. 34 de Brahms, recèle une complexe matrice de motifs thématiques et de relations tonales organiquement liés. Au sein de cette texture extrêmement polyphonique et parfois dense, Stanford, en insistant sur les degrés de dominante et de sus-dominante de la gamme (la–si bémol – notez tout particulièrement la forme rétrograde au début du développement), semble paraphraser Brahms, préoccupé par ce même motif structurel dans son propre Quintette avec piano; quant au second sujet, il suggère un hommage à Schumann, perceptible et dans la manière dont il est introduit par le violoncelle solo, et dans l’harmonie accompagnante. Le mouvement s’achève sur une lueur d’optimisme, mais le Scherzo de type gigue, en sol mineur, nous replonge dans une tournure d’esprit dérangeante, diabolique, aux mètres changeants, aux modèles de phrase irréguliers et à la tonalité fluide. Avec son style «folk-song» plus simple, le Trio, qui hésite entre les dominantes de sol et de si, nous procure un soulagement temporaire mais, en arrière-plan, d’inquiétants courants de la gigue diabolique menacent au violoncelle et à l’alto. Avec le mouvement lent, formulé en si bémol majeur (un lien motivique important avec le premier mouvement), les ombres commencent de se déchirer lorsque le grand don euphonique de Stanford pour la mélodie lyrique autonome peut s’exprimer. En effet, le compositeur a une approche contrapuntique tellement riche qu’il en outrepasse presque, comme Brahms dans son Quintette, le medium du quatuor à cordes et du piano pour atteindre à une envergure orchestrale – une sensation renforcée par l’architecture massive du second sujet (identique, à sa façon, au splendide mouvement lent du Quatuor avec piano de Parry, publié en 1884). En fait, à voir l’écrasante maîtrise de l’inspiration mélodique qu’affichent les mouvements lents des troisième, cinquième et sixième symphonies de Stanford, on en vient à penser que le présent mouvement a fort bien pu être un gabarit essentiel. S’appuyant sur l’aspiration du mouvement lent, le finale offre une conclusion grandiose, radieuse, où ré majeur – cette tonalité si fortement associée à la joie et à l’exaltation – revêt une importance particulière. Ici, les idées musicales de Stanford dévoilent une muscularité tonifiante et un élan rythmique renforcés dans le deuxième groupe et, plus encore, dans la captivante phase de développement. Cette énergie vivifiante, qui entend chasser les ténèbres de la première moitié de l’œuvre, confère au mouvement un irrésistible sens de l’élan et, au Quintette tout entier, une aura de confiance qui devait imprégner la prochaine pièce instrumentale à grande échelle de Stanford, l’«Irish» Symphony de 1887. Bis Mitte der 1880er hatte Stanford drei Opern (die ausgesprochen zwiespältig aufgenommen worden waren), zwei Symphonien, Lieder, sehr originelle Kirchenmusik sowie kammermusikalischen Werke komponiert. Was seine professionelle Laufbahn anbelangte, war Stanfords Selbstvertrauen sowie sein Ruf auf nationaler wie auf internationaler Ebene deutlich angewachsen, und sein Rang als Dirigent sowohl der Cambridge University Musical Society als auch des Bach Choir (sowie als Gastdirigent der Philharmonic Society und anderer Orchester in ganz Großbritannien) nahm ebenfalls stetig zu. Ermutigt von dem hohen Ansehen, dessen er sich unter seinen Kollegen erfreute, begann Stanford zu diesem entscheidenden Zeitpunkt mit der Arbeit an seinem großartigsten Kammermusikwerk, dem Klavierquintett in d-Moll op. 25. Am 7. Februar 1886 schrieb Joseph Joachim an Stanford: „Ich harre Ihres Quintetts mit großem Interesse!“; schon vier Tage später hatte Stanford seinem Freund geantwortet und bestätigt, daß er die ersten drei Sätze des Quintetts bereits fertiggestellt und auch das Finale teilweise schon geschrieben hatte. Joachim, der regelmäßig in Cambridge war und wahrscheinlich den wichtigsten musikalischen Einfluß in Stanfords Karriere darstellte, hatte der Musik des jungen irischen Komponisten immer besondere Aufmerksamkeit geschenkt. Er hatte Stanford im Jahre 1875 während der Komposition eines frühen Violinkonzerts in seiner Studienzeit beraten und war 1876 bei einem Kompositionswettbewerb für Symphonien im Londoner Alexandra Palace, bei dem Stanfords Beitrag (seine Erste Symphonie) den zweiten Preis erhalten hatte, Mitglied der Jury gewesen. Ihre Freundschaft hatte sich während Stanfords Studienzeit in Deutschland in den 1870ern weiter gefestigt, und nach Stanfords Rückkehr nach Cambridge im Januar 1877 erblühte eine professionelle Zusammenarbeit, besonders nachdem sich anläßlich der englischen Erstaufführung von Brahms’ Erster Symphonie und der Verleihung einer Ehrendoktorwürde an Joachim das Augenmerk ganz Englands auf Cambridge gerichtet hatte. Stanford hatte Joachims Spiel immer bewundert. Er hatte ihn schon als Junge in den 1860ern in Dublin und später in Berlin spielen hören, wo das Joachim-Quartett Brahms’ Streichquartett in B-Dur, op. 67 uraufgeführt hatte. Daher war es wohl unvermeidlich, daß Stanford mehrere seiner Kompositionen an Joachim orientieren und ihm widmen würde, aber die Tatsache, daß es sich bei dem ersten Joachim zugeeigneten Werk um das Klavierquintett handelte, zeigt in aller Deutlichkeit, daß der Komponist dem Werk die Rolle eines bedeutenden Tributs und bleibenden Danks an seinen Mentor zudachte. Stanfords Klavierquintett wurde Anfang März 1886 vollendet, und Joachim, der im gleichen Monat nach Cambridge kam, um Beethovens Violinkonzert zu spielen, erlebte bei Stanford zu Hause eine informelle Aufführung des Stücks. Es wurde am 10. Juni 1886 unter der Schirmherrschaft der Cambridge University Musical Society in der Cambridger Guildhall uraufgeführt, und auch diesmal spielte Stanford selbst Klavier. Das Werk wurde nicht von einem deutschen Verlag sondern von Novello veröffentlicht, ein deutliches Zeichen, daß der Herausgeber es für wichtig erachtete, das Werk im eigenen Katalog zu führen. Novellos Geschäftssinn leistete dem Verlag gute Dienste: Das Quintett sollte in England und im Ausland oft aufgeführt werden und das Interesse solcher Pianisten wie Hallé, Dannreuther, Heckmann und Coenen auf sich ziehen. Offenbar vom kühnen Umfang der Quintette Schumanns und Brahms’ beeinflußt, legte Stanford sein Werk im großen Rahmen an und gab ihm, die ersten zwei Sätze in Moll- und die letzten beiden in Dur-Tonarten gehalten, einen übergreifenden erzählerischen Spannungsbogen, der den Hörer von melancholischer Introspektion zu extrovertierter Freude und Optimismus führt. D-Moll war für Stanford eine Tonart des sorgenvollen Grübelns (seine Zweite Symphonie, die den Beinamen „die Elegische“ trägt und wahrscheinlich in Erinnerung an seinen Vater entstand, bewohnt die gleiche tonale Welt), und dies zeigt sich deutlich in der dunklen, ja fast unheimlichen Eröffnung des ersten Satzes, einer riesigen intellektuellen Studie von dorischen Ausmaßen, die, wie der erste Satz von Brahms’ Quintett in f-Moll, op. 34, eine komplexe Matrix von organisch miteinander verknüpften thematischen Motiven und tonalen Beziehungen aufweist. Innerhalb des hochgradig polyphonen und zeitweise sehr dichten Gewebes scheint Stanford in seinem Beharren auf jenen die Dominante und die Dur-Parallele bezeichnenden Stufen der Tonleiter (also den Tönen A und B – man beachte besonders die rückläufige Bewegung zu Beginn der Durchführung) Brahms’ ähnlichen Umgang mit dem gleichen strukturellen Motiv in dessen eigenem Klavierquintett geradezu zu paraphrasieren. Das zweite Thema legt sowohl in der Art seiner Einleitung durch das Solo-Cello als auch durch die begleitende Harmonie eine Hommage an Schumann nahe. Der Satz endet mit einem Schimmer von Optimismus, aber in dem an einen Jig erinnernden Scherzo in g-Moll wird der Hörer, verunsichert von den sich verschiebenden Taktarten, den ungleichmäßigen Phrasenmustern und der unschlüssigen Tonalität, in einen beunruhigenden, dämonischen Geisteszustand zurückgeworfen. Das einfachere Trio im Stil eines Volkslieds, das zwischen den Dominanten G und H schwebt, bringt zeitweilige Erleichterung, doch im Hintergrund lauern im Cello und der Bratsche weiterhin verstörende Untertöne des dämonischen Jigs. Mit dem in B-Dur abgefaßten langsamen Satz (eine wichtige motivische Querverbindung zum ersten Satz), beginnen die Schatten zu verfliegen, indem der aus Stanfords großer Gabe zur Komposition lyrischer, sich selbst weiterentwickelnder Melodien resultierende Wohlklang freien Raum erhält. Tatsächlich ist Stanfords kontrapunktische Konzeption von solchem Reichtum, daß man fast spürt, wie sich der Komponist, wie auch Brahms in seinem Quintett, über das Medium Streichquartett und Klavier hinaus zu orchestraler Erhabenheit hin bewegt – ein Eindruck, der durch die riesige Architektur des zweiten Themas (in seiner Art dem großartigen langsamen Satz von Parrys 1884 veröffentlichtem Klavierquartett ähnlich) noch verstärkt wird. Die später entstandenen entsprechenden Sätze von Stanfords dritter, fünfter und sechster Symphonie, die, was die melodische Inspiration angeht, ein überwältigendes Können an den Tag legen, lassen in der Tat darauf schließen, daß dieser Satz durchaus eine wichtige Vorlage gewesen sein mag. Den Zielsetzungen des langsamen Satzes folgend, sorgt das Finale für einen prachtvollen, leuchtenden Abschluß, wobei D-Dur, eine Tonart mit der man besonders Freude und Begeisterung assoziiert, eine ausgesprochen wichtige Rolle spielt. Stanfords musikalische Ideen sind hier von erfrischender Kraft und haben rhythmischen Elan, Merkmale die in der zweiten Themengruppe und besonders in der packenden Durchführungsphase noch hervorgehoben werden. Diese belebende Energie, die dazu dient, die Düsterkeit der ersten Hälfte des Quintetts zu vertreiben, gibt dem Satz ein zwingendes Gefühl von Schwung und dem Werk als ganzem eine Aura von Selbstsicherheit, die auch Stanfords nächste großangelegte Komposition, die „Irische“ Symphonie aus dem Jahr 1887, erfüllen sollte.